Last week, on Saturday, January 23, 2016, The Philadelphia Inquirer came out with its early Sunday edition. 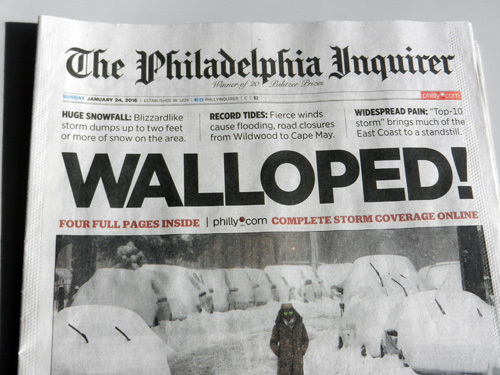 The headline printed in big, bold, black, capitalized letters read... BLIZZARD! Brevity can be very telling. Snow began falling at 7 PM Friday, as meteorologists predicted, and continued throughout Saturday into Sunday morning. Allentown, Pennsylvania, about 60 miles north of us, expecting only a coating of snow received a walloping 31.9 inches! And here in Philadelphia we experienced our 4th largest snowfall on record. Yes, it's winter and yes, we live on the East Coast, BUT knowing that doesn't make shoveling 22.4" of snow any easier. What was easy, was staying indoors all day Saturday and 'flaking,' with power intact, nowhere to go and nothing in particular to do, while the winds howled and snow swiftly accumulated on every house, road, and tree for hundreds of miles. For me, Winter Storm Jonas was a gift of frozen time to do as I pleased. 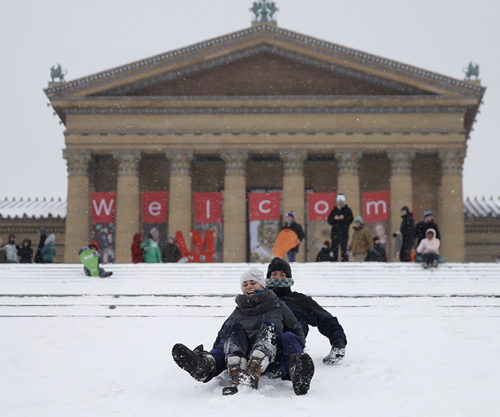 Others were pleased to venture outdoors: sledding and snowboarding down the Art Museum steps, plodding through silent city streets void of traffic, and gathering at Washington Square for an afternoon snowball fight organized on social media. I chose to remain cozy, in lounging clothes, under the covers with an interesting book... a book by Marie Kondo called, Spark Joy: An Illustrated Master Class on The Art of Organizing and Tidying Up, the companion book to The Life-Changing Magic of Tidying Up: The Japanese Art of Decluttering and Organizing... quite a mouthful for two books about reducing clutter! But seriously... decluttering is a vast task, one I hope to conquer in this lifetime and live to talk about in another post. But for now, the gist of Kondo's method for successfully eliminating clutter is to discard intensely, in one shot rather than little by little or by one location, because in her words, "Tidying is not the purpose of life." She also suggests tackling one category at a time, like clothing: gathering items from every drawer, closet, and storage bin, piling them in one spot, and holding each item to see if it sparks joy. If it makes you happy, keep it, if not, discard it. Once all articles from multiple categories have been sorted, a permanent storage system can be devised. Wow!... 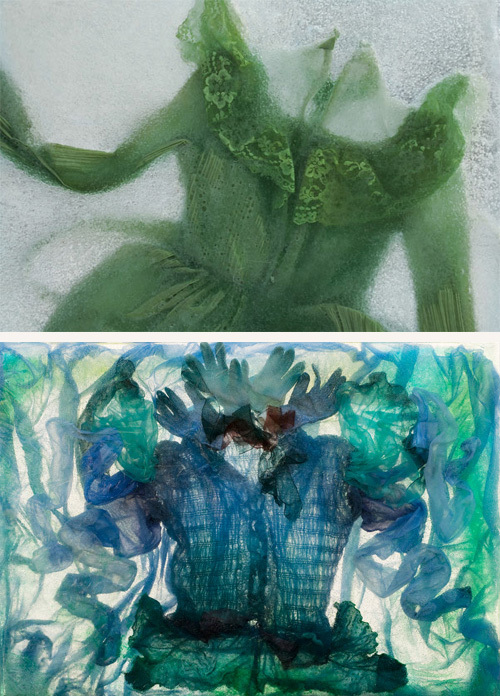 all this snow, ice, and talk of clothing conjures images of work by Vancouver's environmental artist Nicole Dextras, who uses ice as a medium to create sculptures of frozen garments. "Although frozen in time, the garments appear to dance, simultaneously forming and deforming, like unmasked shape shifters." ~ Nicole Dextras. As I look up from my book, Spark Joy (abbreviated title), I fixate on a green T-shirt hanging in my closet. It's faded; it's fibers broken down from years and years of laundering so much so that it's become somewhat sheer and the sleeves, when worn, stretch down to my fingertips. I don't own expensive, fashionable clothing, but still find it hard to part with anything that functions and is comfortable. Sadly, this shirt lacks both criteria and no longer sparks joy. So out of respect for my faithful garment and before disposing of it, I decide to give it one last romp, 'ala' Nicole Dextras, while there's still snow on the ground. It may not be art, but it warms my heart, making parting somewhat sweeter. Here's Mr. Tee: hanging from a tree basking in the sun, relaxing on a slatted bench taking in the view, and laid to rest before being compactly folded, somewhat like an American flag before disposal, but without the ceremonial fire. Progress? Perhaps. One item is gone! Hardly the minimalist lifestyle I'm after, but it's a step in the right direction. "One shovel at a time." At least that's the mantra I kept telling myself as I attempted to clear heaps of snow from our sidewalks and driveway last Sunday. Five hours later, thanks to my husband and a good neighbor, Matt, our tidying was done! If I could just say the same for the interior of my home. Were you affected by Winter Storm Jonas, and if so, how did you spend your days? Do you have an item of clothing that you won't let go of though it's seen better days? Everything in its place or a zillion places loaded with everything? What, if anything, tends to accumulate in your home that requires constant tidying? For me, hands down, it's paper... assorted piles and piles of it! I'm a big note-taker, scanner and printer of interesting articles, and saver of things I might need later. Lucky me. "May your home be your haven and your sidewalks and driveway be free of snow." Well... maybe just a dusting. 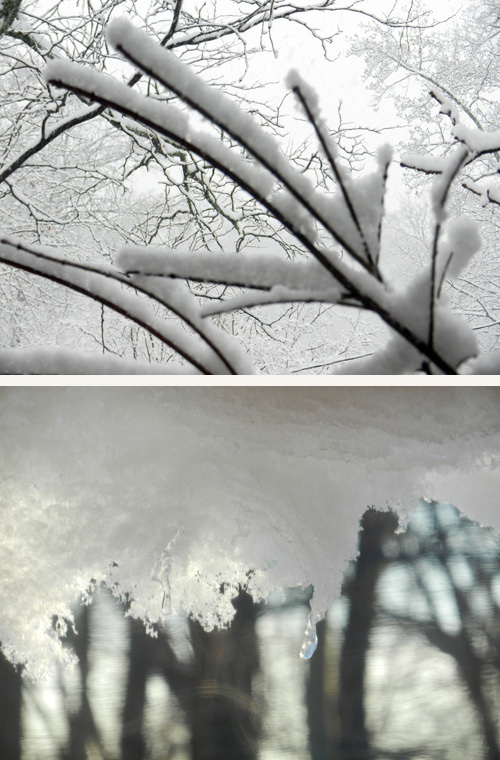 Your pictures of the snow and ice are beautiful. I had no idea that the storm was named. I would have loved to sled ride down the art museum steps! 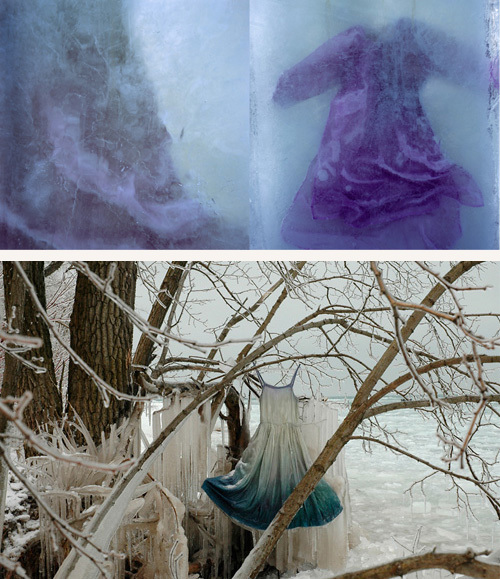 The ice sculptures of clothing are beautiful, with a watercolor-like quality to them, especially the second one. Your T-shirt sleeves made me laugh. They certainly "grew" over time! When we went out to dinner this past weekend I wore the blazer that used to be part of a pantsuit that I've had since I was in 10th grade. That makes 50 years that I have had it and it still looks great! Blows my mind that I've kept it so long! I tried a modified version of the folding technique on all the tops in my dresser drawers in Marie Kondo's book. I now have room to spare and they are easier to see and access. The place that constantly has clutter on it is the long counter in the kitchen. There are to-do lists, mail, magazines,notes, clippings from magazines or the newspaper, mail,plants/flowers sometimes and items waiting to be taken out to the garage for recycling. Drives me crazy because I hate clutter. My desk is a cluttered mess too. I did come up with one good system for keeping all those clippings, articles and miscellaneous tidbits that I want to keep. I bought a couple of binders that have clear plastic pages that I slip the items in. Works great. Forget that Winter Storms have been named for years now, what I want to know is how you've managed to fit into a garment you first wore 50 years ago!?! It blows my mind! Must be all that healthy eating and exercise. Congrats to you!!! So glad you liked my photos of snow and Nicole Dextras' ice sculptures. Come Spring, I'll have to post some of her 'Botanical Wearables,' they're an eyeful. re:clutter... I too have a long horizontal counter that seems to be the 'catch all' place for everything that doesn't seem to have a place of its own, and almost daily, I have to dedicate time to tidying it up. Hopefully, with some motivation, I'll get this rectified. And thanks for the great tip on handling my paper clutter. I LOVE the idea of binders with plastic sleeves to hold clippings, articles, and various tidbits. What a perfect solution! Guess once I clear off that long horizontal counter, I'll have plenty of space for a vast binder collection... ha!